a case study on Skype mobile application, redesigned with embraceable change in order to improve its user experience. FEATURED ON uxplanet.org AND MARVEL. Product research and audit, User research, User interviews, Affinity mapping, User persona, User experience mapping, Product design, Usability testing. This is self-initiated project. The content and creator of this article is not affiliated with the company mentioned. Microsoft Corporation acquired Skype Communications. Shortly after its acquisition, Microsoft began integrating the Skype service with its own products. Microsoft phased out its long-standing Windows Live Messenger instant messaging service in favour of Skype. Microsoft announced that in 2015, Lync would be replaced by Skype for Business. 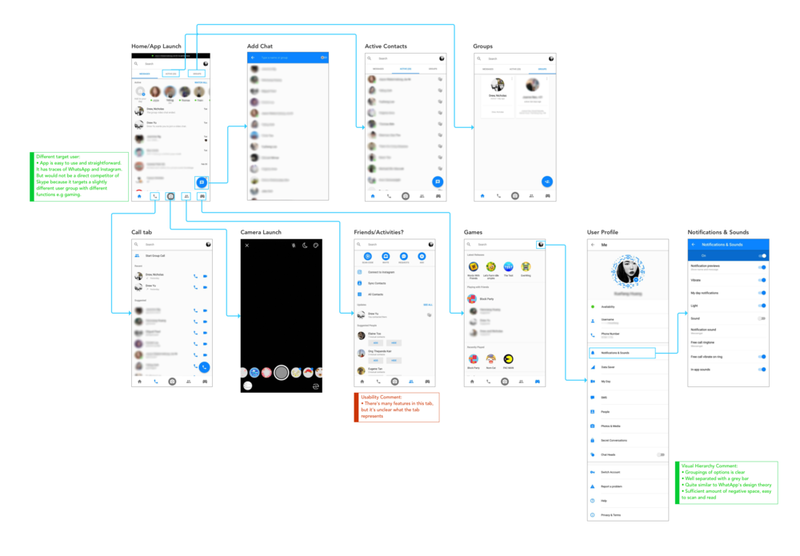 Skype launched its newly-designed desktop and mobile app with a radical change into flat-design, social media interactions and personalisation in an attempt to battle with other messaging services. The team sent out an online questionnaire of 10 questions and collected 26 responses. The questions focuses on the type of communications app users are exposed to, user engagement with Skype and what they expected out of communication apps. The feature that users valued and used the most in Skype is video calling (single and group). View high-res versions here or read the detailed evaluation in my post on Medium. Both parties take many steps to accomplish their goals. Our goal is to design an update of the app that provides a better user flow for our users through a reorganised user interface, and a reorganisation of key elements. With our user research conclusion, we created 2 user personas. While working on their user journey, key frustrations and wireframe (of the app), we noticed that there were several cross over in their pain points despite that being different individuals. 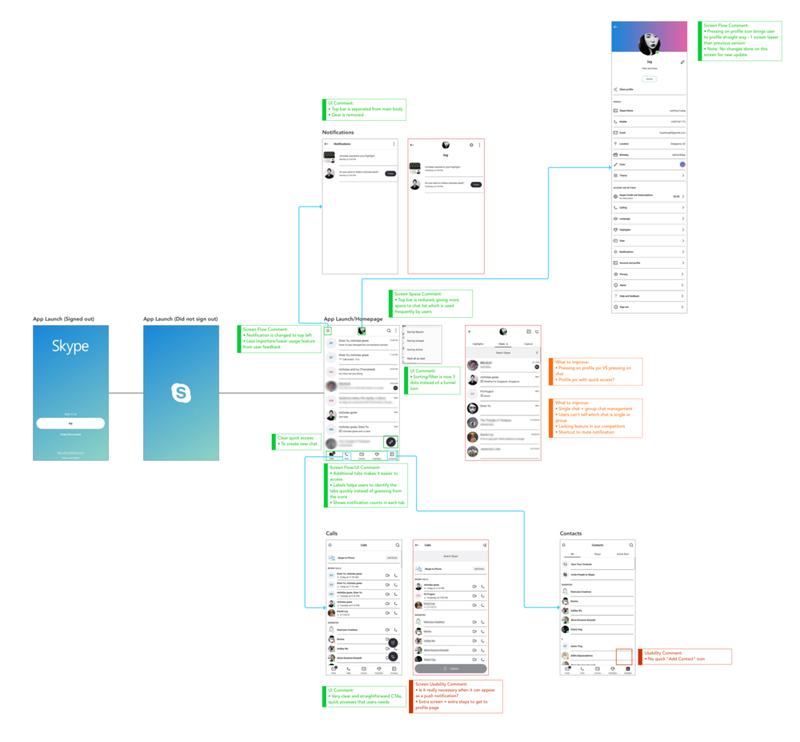 Hence, I created the following user experience map that is applicable to our pool of users who shared a common goal of using Skype to communicate through text messaging, audio call or video call. Click here for high-res version. View prototype on Invision here. Users can add another person to the call even if the first line did not pick up. Notification bell on the top left hand corner is replaced with app settings (previously together with profile settings). It is redundant as all notifications can be accessed with the bottom navigation. A quick access button can be triggered by clicking on the profile picture. Users can do an audio call, video call, message and view user’s profile. Long press gesture is introduced and it triggers group selection actions e.g mute, delete, pinning. Quick button for adding contacts is included, which was previously missing. Users now have 2 tabs of “Chats” and “Group Chat” to differentiate their chat groupings, a feature that is lacking in WhatsApp and Facebook Messenger. Skype Translator can be accessed from individual chat windows by clicking the “+” button, instead of it being buried in another user’s profile. Skype Translator now works as the app system, instead of a chat bot as a third party participant to the chats. Sign in, contacts list, settings page's hierarchy is improved with larger headers and more spacing for higher breathability. Chat window has a better differentiation between cards, chat bubble and other content. Highlights screen is completely redesigned to allow users to browse efficiently and pleasantly. They can view by users of view by timeline. Translator is now build-in to chat windows instead of having it as a third party to the chat. Users have to complete 12 tasks. Some tasks are specific instructions, while some are more conversational and feedback based. After testing 4 users, we noticed a trend of consistent fail rate. We decided to pause the tests and make iterations before we proceed for another round of testing. Sign out was set under profile, but users head to settings intuitively for sign out. We migrated the sign out button to settings. The drop down button was a downward pointing arrow, but users did not realised that it is an actionable button. Hence, we changed it to the 3 dot, which is a more conventional and widely recognised CTA. The Skype translator button was originally placed in the “+” button, but users head to the 3 dot to launch translator. A few users feedback that the “+” was more of adding something into the conversation. We shifted the translator to 3 dots. You can view the result excel sheet in detail here.